An independent collective of up-and-coming designers with a little urban grit, IndieShopper is a great place for those who fancy accessories a little off the straight and narrow. In particular, their belts are hipster gear central. 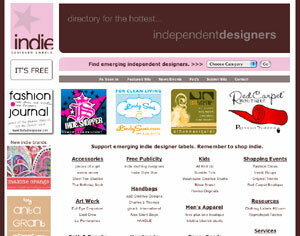 Indie Shopper is the hottest designer boutique for today’s freshest fashion designers in the county. indieshopper.com features clothing, accessories, jewelry and more. We’re dedicated to finding emesrging fashion designer students labels from across the country. No need to travel to shop Melrose Avenue in L.A. or shop SoHo in New York. If you’re looking for something original, something hip (and sweatshop-free), you've come to the right place. independent designer directory for today’s freshest Top Indie Designers, Designers indie clothing, accessories, indie jewelry and more. We’re dedicated to finding the hottest top indie designer labels from across the country.